Starter: Take a copy of the diagram to the right and paste it into a word document with the title and aim above. Add four text boxes, each pointing to a different layer. Choose the correct label from the four underneath and copy and paste them into the correct place. Task 1 - It is a good skill to be able to complete sketch maps in iGCSE Geography. To make your life a little more difficult, you are going to plot the information above but onto a blank Pacific Centred map of the world. Task 2 - Label each of the plates and add the direction arrows and identify and label 'The Pacific Ring of Fire'. Task 4 - Watch the video to the right hand side and then have a play with this fantastic tool. Stop the video when you recognise any landmass e.g. North America. What period was that? Task 5 - Take a screenshot of now and 100 million years from now on the YouTube video. Annotate the major differences between now and in the future. Try to find at least five differences. How has the location of your home country changed? Task 6 - Study the cross section diagram to the right that shows a new feature - convection currents. Watch the quick video below too for extra explanation. Take a copy of the cross section to the right and then sort out the 8 statements below into the correct order underneath. Don't forget to add a title to your work. It is these currents that create friction with the crust above and causes it to move. This is the thickest section of the earth with a diameter of about 2900km. 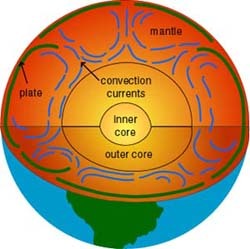 It is often described as being semi-molten, but in reality the top is hard rock and as you near the outer core it is beginning to melt (magma). Convection currents are found in this layer. This layer is believed to be solid, because of the immense pressure placed upon it. It contains the centre of the earth which is about 6,378km from the surface. It is also extremely hot at about 5,500 degrees centigrade. Plot the top 10 earthquake (by magnitude) locations onto the same sheet that you plotted the volcanoes on. Use a suitable symbol and complete the key too. Task 2 - Scroll down the Wikipedia entry to view the figures for the most deadly earthquakes of all time. What is the relationship between the magnitude of an earthquake and the death rate? What other factors could be responsible?